The wait stage pauses members for a period of time, before progressing them to the next stage in the Workflow. All available options allow the using of Stored Values. For more information on using stored values, please read the following article. 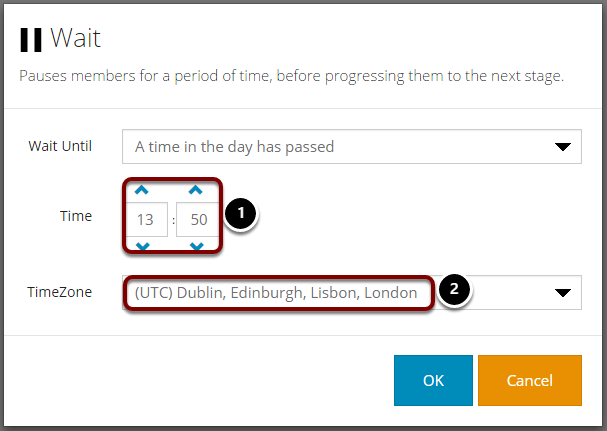 Wait until a date/time has passed (a date-time value with a time-zone). Wait until a time in the day has passed (a time value with a time-zone). Wait until a date constructed from date units has passed (date units available are day in month (first, last or any), day(any or Monday-Friday), month (any or January-February) and time with time-zone). 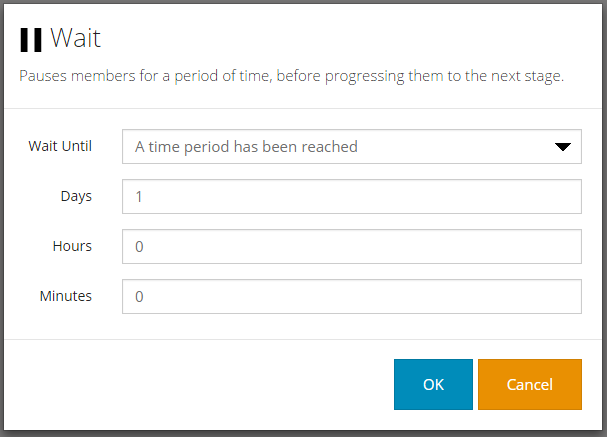 Set the number of days, hours or minutes a member should wait at this stage in a workflow, before progressing. Members in this stage will wait until a particular date and time before progressing. Set the date and time that you would like members to progress to the next stage. Set the timezone that this stage should abide to. Some date logic means that members could hit a stage at the beginning of a day (midnight). 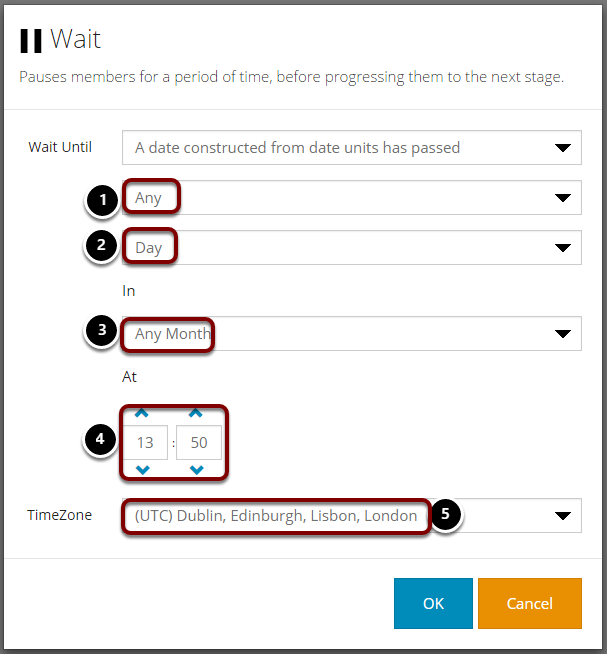 Using this 'wait' stage type you can apply further logic to wait until a particular time during the day before progressing members to the next stage. Select the time of day that you would like members to progress to the next stage. The first Monday of any month - Will set a member to wait until the next Monday that falls at the beginning of a month. Any Wednesday in February - Will set a member to wait until the next Wednesday in February. The last Friday of any month - Will set a member to wait until the last friday on the month. The timezone you would like the wait stage to adhere to. Stored Values can be used within any of these parameters. 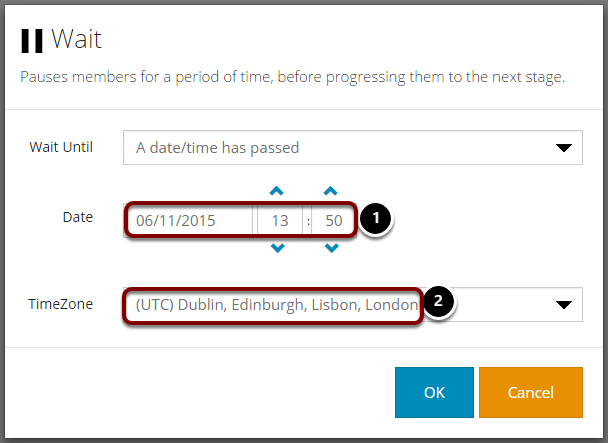 Wait until the parts of a date field are matched e.g. day and/or month in any year. 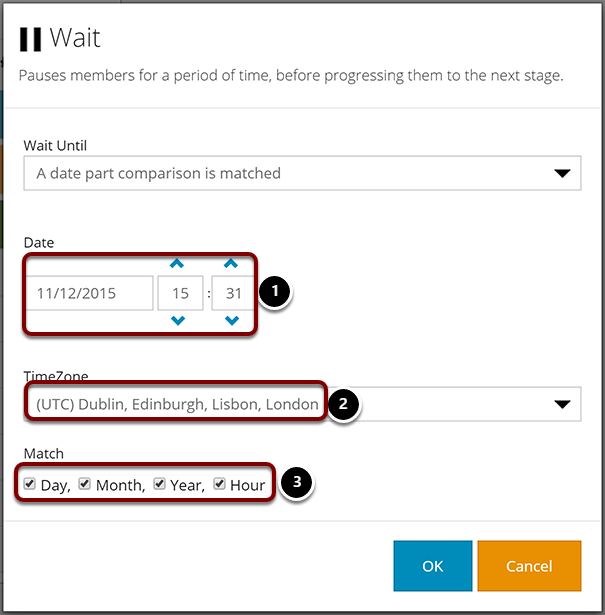 This wait stage allows you specify a date and time, and then cause the member to wait until particular parts of the date and time are matched. By setting the date as 11/12/15 you may choose to advance the member every time the day of that date is matched (the 11th any month). This wait stage is much more powerful when used with stored values, as a stored value could hold the member's contract renewal date, or date of birth etc. By using the stored value you could query only the day and month (ignoring the year) and send an email each year on that date. 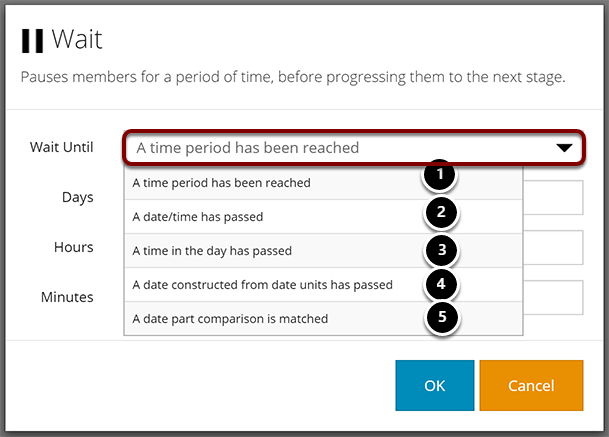 Select the portions of the date and time you would like the system to match before progressing a member to the next stage.